contrast can be changed via the setup button. With the beginning of the new millennium, water is becoming a strategic resource. Water has been and will continue to be a major factor for our survival, and the continuation of our way of life. Because of the limited resources of fresh water, careful use of it, as well as frequent reuse (after appropriate treatment) are requirements for sustainable development. 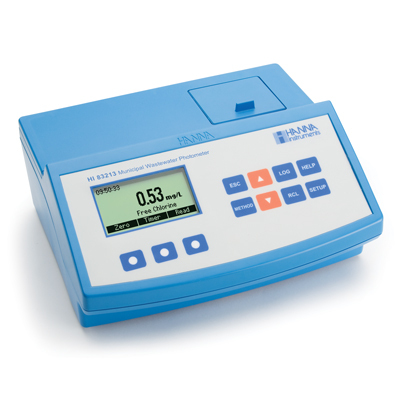 HI83213 is a multiparameter bench meter that measures twenty-four methods essential for municipal wastewater analysis. It has four channels allowing for a wide range of tests. The optical system of HI83213 is based on special subminiature tungsten lamps and narrow-band interference filters to guarantee both high performance and reliable results. HI83213 has a powerful interactive user support that assists the user during the analysis process. A full tutorial is available in the Setup Menu, and the Help Menu provides assistance for every step in the measurement process. This meter can be connected to a PC via a USB cable, where the data can be managed with optional HI92000 Windows® compatible software. Light Source up to 5 tungsten lamps with different narrow band interference filters. 60 mL glass bottle for dissolved oxygen analysis, scissors, AC/DC power adapter and instruction manual.